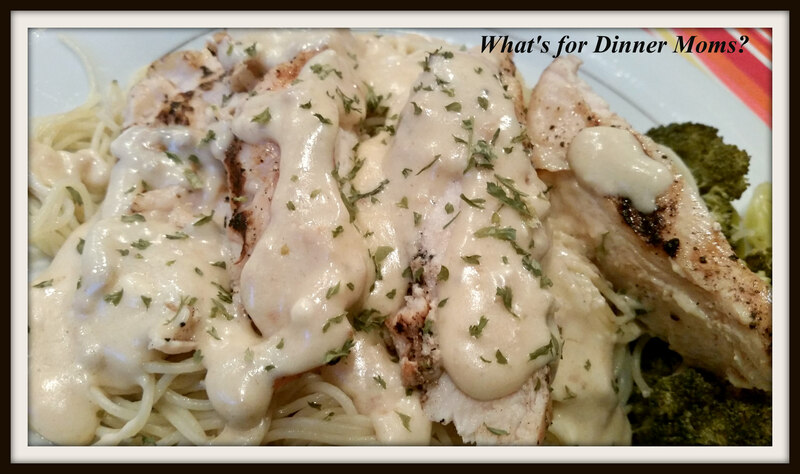 Grilled Chicken with Garlic Cheese Sauce – What's for Dinner Moms? Well, our air conditioner is officially dead. We have some people coming towards the end of this week to give us quotes on a new one. We are all still sleeping in one room despite it being a bit cooler during the days. Unfortunately there are no trees around our house for natural cooling. We have fans going downstairs but it doesn’t help too much. To help keep the house a bit cooler we are grilling out and going to be using our slow cooker quite a bit more than usual. My kids were so excited to have real dinner again. They both said they were sick of camp food and then eating out every day for three weeks. I think right now I could make just about anything and they would be happy. I don’t think we will be eating out for quite awhile. I was reading about how restaurants are seeing numbers of patrons drop off dramatically because more people are changing their eating habits to eat more at home and less in restaurants. Are you one of those people? Up until this vacation we were and now I know we will be eating at home again. We all loved this meal. It was so simple too. Pounding down the grilled chicken made it cook faster. All I did was pepper it before cooking it on the grill until it was just cooked through. The sauce had quite a bit of garlic in it but we like it like that. I would suggest starting with less and building up to the flavor you like for your family. The cheese sauce was thick but it tasted really good with the chicken and pasta. I served this with thin spaghetti, a side of steamed broccoli and a green salad. Pepper raw chicken before cooking on grill. While chicken is cooking begin sauce. Melt butter in a large saucepan. Add garlic and allow to cook for 2-3 minutes to become fragrant. Be careful not to brown or burn. Sprinkle flour over the butter and stir until smooth. Continue stirring and cooking for 2 minutes. Slowly stir in chicken stock until the mixture is smooth. Slowly add in the cream and allow to cook for about 5 -7 minutes until it thickens. Stir in the Parmesan cheese and cream cheese until no lumps remain. Taste and add salt and pepper as desired. If you need more garlic at this point use a garlic powder to add a bit more flavor. Serve sauce over chicken and pasta (if desired). Thank you! Not a “must” here but these 90 degree days are getting tiresome. Thank you! In my house the more garlic the better! This looks so good! Anything with cheese and garlic, I’m in! And sorry about your AC! That stinks! Thanks. It stinks but it is not life threatening so we are trying to keep it all in perspective though we weren’t expecting the $$$ flow issue at this point. We just got our air conditioner replaced this spring. It hadn’t worked since we moved in 8 years ago, and it was no big deal – we had a window unit in the spare bedroom and would use fans to direct the air around. It never really got cool in the house, but it took care of most of the humidity so it was bearable. However now we have two little ones and no longer have a spare bedroom, so we had to bite the bullet and get it done. We’re SO glad we did. We go out for dinner once a month. Sort of. We live next to a tavern and they have a really good fish fry on Fridays, so once a month we carryout a fish fry. Thank you! I love a good fish fry but that is not a thing here. Miss them so. We very rarely eat out, even on vacation if we can cook where we are at in either our RV or perhaps a hotel room. The garlic sauce looks MUY BUENO, I bet it was fantastic over the chicken and spaghetti! Thank you! It was delicious. My kids were surprised at how much they liked it because it was a bit heavy on the garlic. Looks so good and sounds fantastic. Thank you so very much! Stopped by your blog. Looks like you are off to a good start! This looks so good! Anything with cheese and garlic, I’m in! And sorry about your AC! Thank you! My kids gobbled this up!